9. Alcaeus, late C7th to early C6th B.C. Of these only notable fragments of the works of Alcman, Sappho and Alcaeus survive. 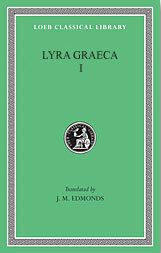 Lyra Graeca Volume I. Translated by Edmonds, J M. Loeb Classical Library Volume 28. Cambridge, MA, Harvard University Press; London, William Heinemann Ltd. 1922. This Loeb volume has since been replaced by a new compilation translated by David Campbell which is available from Amazon.com. In addition to the translation, the book contains an introduction to Greek lyric, source Greek texts, and an index of proper names. Among their earliest lyric poets the Greeks numbered Olen, Linus, Pamphos, Orpheus, Chrysothemis, Philammon, Thamyris, Eumolpus, and Musaeus. Works ascribed to some of these were extant in antiquity. See for instance, Hdt. 4. 25, 7. 6, Plato Crat. 402b, Rep. 364e, Arist. H.A. 563a, Paus. 1. 14. 3, 22. 7, 7. 21. 9, 9. 27. 2, 29. 7 f, 10. 7. 2, Clem. Al. Str. 1. 21. 131, Procl. Ap. Phot. Bibl. 320. Alexander in his Collections on Phrygia declares that instrumental music was introduced into Greece by Olympus and by the Idaean Dactyls or Priests of Cybelè. The first flute-player according to him was Hyagnis, who was followed by his son Marsyas, who was succeeded by Olympus. [on lyre-sung “nomes”]: We are told that the Olympus of whom we spoke just now, a flute-player from Phrygia, composed a flute-nome3 to Apollo which is known as the Many-Headed. This Olympus, however, is said by some authorities to have been a descendant of the first Olympus, son of Marsyas, who composed nomes to the Gods. – This earlier Olympus was in his boyhood a favourite of Marsyas, and learning flute-playing of him, introduced the musical nomes3 into Greece, where they are now used at the festivals of the Gods. – According to another account, however, the Many-Headed nome is the work of Crates “a pupil of Olympus” though Pratinas declares it to be the work of Olympus the Second. The Harmatian nome, as it is called, is reputed the work of the first Olympus, the pupil of Marsyas . . . and this view is supported by Glaucus in his Account of the Ancient Poets . . . It is held, however, by some writers that the Harmatian nome was a Mysian invention, Mysia having produced flute-players in ancient times. According to Arisoxenus, musicians ascribe the invention of the Enharmonic scale (EE’FABB’CE)4 to Olympus. Before his time the only scales had been the Diatonic and the Chromatic. The invention is supposed to have come about thus: In descending in the Diatonic scale his melody frequently passed from B or from A to F, omitting G. Realising the beauty of this effect, Olympus in his astonishment accepted the principle for the whole system, and composed in it in the Dorian “mode,” rejecting all intervals peculiar to the Diatonic or Chromatic scales and concerning himself directly with the mode. Such was the origin of his Enharmonic scale . . . It is clear that Olympus made a real advance in music by introducing an entire novelty, and was the father of good music in Greece. We are told by Aristoxenus in the first Book of his Treatise on Music that the first flute-player to use the Lydian mode was Olympus in his Lament for the serpent Python. The Olympus who is reputed the originator of art-music in Greece, is considered to have invented not only the Enharmonic scale but the two rhythms known as the Prosodiac which is that of the Nome of Ares, and the Choree which occurs so frequently in the tunes used in the worship of Cybelè. The Bacchius also is sometimes ascribed to him.5 These statements are borne out by each of the ancient melodes. Take for instance the Enharmonic scale employed by Olympus with the Phrygian mode and the Epibatic Paeon,6 the combination which gives its character to the opening of the Nome to Athena. Both melody and rhythm make their contribution, the metre being merely changed in a cunning way so as to become as it were trochaic instead of paeonic, and the effect is completed by the use of the Enharmonic scale of Olympus. Moreover, although the ancient poets used only some of the “modes,” they knew them all. It is not through ignorance that they confine themselves to employing so few strings,7 or that composers like Olympus and Terpander and their followers denied themselves the use of many strings and the variety which that entails. This is clear both from the works of Olympus and Terpander and those of the composers who belong to the same school. Though they are quite simple and written only for a few strings, they so far excel the elaborate works written for many, that the style of Olympus remains inimitable and the exponents of the opposite principle have to take the second place. [on music]: This would be clear if we could show that music affects our characters. And we can, by many instances, notably that of the musical compositions of Olympus, which admittedly carry us away, an effect which is a condition of the character of the soul. Olympus: A Phrygian, the younger of the name, a flute-player who flourished in the time of Midas8 son of Gordias. Nome of Olympus: One of the composers for the flute. Demosthenes. My poor old mate, how d‎’ye feel? Nicias. Bad, as bad as you do. Olympus was a musician, a pupil of Marsyas. He wrote dirge-nomes for the flute. The district of Corinth, which is part of the district of Argos, ahs its name from Corinthus, who to the best of my belief is seriously called a son of Zeus only the local if loud authority of the inhabitants. Eumelus son of Amphilytus of what is known as the house of the Bacchids, the reputed author of the epic poem (Corinthiaca), declares in the Corinthian History, if indeed his title to this is not false, that this country was first settled by Ephyra daughter of Oceanus . . .
[Aetolian Leda]: . . . She is made the daughter of Sisyphus and Panteiduia by Eumelus in the Corinthiaca.
. . . We are told this by an historical poet called Eumelus. What Hesiod wrote was put into prose and published as their own by the historians Eumelus and Acusilaüs. Moreover the statue of Apollo at Delphi is shown to have been a pillar by the words of the poet of the Europia . . . This account (of Dionysus) is given by many authors, but occurs first in Eumelus the poet of the Europia. According to the author of the poem on Europa, the first player on the lyre was Amphion, who was taught by Hermes. The poet of the Titanomachy, Eumelus of Corinth, Arctinus, or whoever the good man may be . . .
Fourth year of the Fourth Olympiad (B.C. 761): Flourished Eumelus, the poet of the Bugonia and the Europia. Vide Frag. 1, Clem. Al. Str. 6. 264, Paus. 2. 3. 10, 2. 2, Apollod. 3. 8. 2, 9. 1, 11. 1, Sch. Ap. Rh. 2. 948, 3. 1371, 4. 1212, Tz. Ad Lyc. 480, ad Hes. Op. 1. p. 23, Laur. Lyd. Mens. 4. 48, and for fragments of these epics Epic. Gr. Frag. p. 185. [on Messenia]: In the reign of Phintas son of Sybotas the Messenians first sent a sacrifice and a male chorus to Apollo at Delos. Their trainer in the processional song to the God was Eumelus, and the epic lines they sang are believed to be the only genuine work of Eumelus now extant. 10. cf. Ibid. 2. 1. 1: ref. to Messenia’s struggles with Sparta c. 725? When Poseidonius says this, he does not realise that the magadis is an ancient instrument, because Pindar plainly states that Terpander invented the barbitos or lyre to respond12 to the Lydian pectis or lute, in the words “Which Lesbian Terpander invented of old to vibrate in answer to the low-pitched lute at the feasts of the Lydians;” and the pectis and the magadis are the same . . . It is clear that Terpander was earlier than Anacreon from the following considerations. According to Hellenicus both in his metrical and in his formal lists of Victors at the Carneian Festival, the first recorded name is Terpander’s; and we know from Sosibius’ Chronology that the festival was founded in the 26th Olympiad (B.C. 676-673), while Hieronymus’ tract On Singers to the Lyre, which forms the fifth Book of his Treatise on the Poets, assigns him to the time of the lawgiver Lycurgus, who is admitted on all hands to have arranged with Iphitus of Elis the first Olympic Games reckoned in the list (B.C. 776). From the time when the Lesbian Terpander son of Derdenes . . . the “nomes”. . . and changed the style of music 381 years, in the arconship of Dropides at Athens (B.C. 645). Olympiad 33. 2 (B.C. 647) Flourished Terpander the singer to the lyre. In the beginning did Orpheus son of Calliopè beget the motley-musicked shell on Mount Pieria, and after him came the famous Terpander, born of Aeolian Lesbos at Antissa, and yoked the Muse unto poems ten. And lo! now Timotheus giveth the lyre new life with times and measures of eleven strings. The musical historians attribute the Dorian nete or octave-note to Terpander, musicians before him not having employed it. Moreover, although the ancient poets used only some of the “modes,” they knew them all. It is not through ignorance that they confine themselves to employing so few strings, or that composers like Olympus and Terpander and their followers denied themselves the use of many strings and the variety which that entails. This is clear both from the works of Olympus and Terpander and those of the composers who belong to the same school. Though they are quite simple and written only for a few strings, they so far excel the elaborate works written for many, that the style of Olympus remains inimitable and the exponents of the opposite principle have to take the second place. According to Heracleides’ Collection on the Musicians, the art of singing to the lyre and the kind of poetry which belongs to it were the invention of Amphion son of Zeus and Antiopè, who presumably was taught by his father. His authority is the register preserved at Sicyon, from which he derives his lists of the priestesses of Argos, the poets, and the musicians. Of the same generation, according to him, were Linus . . . , Anthen . . ., Pierus . . ., Philammon . . ., Thamyris . . . , Demodocus . . . , and Phemius . . . These poets’ writings were not in prose, but resembled those of Stesichorus and the old lyric poets who wrote epic lines and set them to music. Even Terpander, he declares, whose forte was the citharoedic or lyre-sung nome, and to whom he ascribes the naming of these nombes, in every one of them set his own or Homer’s epic lines to music for singing at the Games. In the same way Clonas, the first composer of flute-sung nomes and the originator of processional songs, used elegiac and epic verse . . . The nomes of these flute-poets, my excellent Onesicrates, were sung to the flute, and are these . . . The lyre-sung nomes, which were established much earlier, namely in the time of Terpander, were first named by him, and are these: Boeotian, Aeolian, Trochaic, High-pitched, Cepion, Terpandrean, and Four-song. Terpander also wrote lyric Preludes in epic metre; and it becomes clear that the ancient lyre-sung nomes were composed of epic lines, if we consider that Timotheus, when he employed the dithyrambic style, interspersed his earlier nomes with them, in order to avoid the appearance of breaking the rules of the ancient music. There is reason to believe that Terpander was supreme in the art of the lyre-song. It is recorded that he won the prize at the Pythian Games four times running; and the perios at which he lived must have been very early, because Glaucus the Italian in his History of the Ancient Poets and Musicians puts him before Archilochus, making him only a very little later than the first composers of the flute. Alexander, in his Collections on Phrygia, declares that instrumental music was introduced into Greece by Olympus, and also by the Idaean Dactyls or Priests of Cybelè, and that while the first flute-player was Hyagnis, who was followed by his son Marsyas, who was succeeded by Olympus, Terpander (the lyrist) emulated in his verse Homer and in his music Orpheus, who appears to have been entirely original . . . It is said that some of the citharoedic or lyre-sung nomes thought to be the work of Terpander were really composed by the ancient Delphian composer Philammon. In fine, lyric song continued from Terpander’s time to that of Phrynis to be wholly simple. Poets were not permitted in those days to compose for the lyre as they do now with frequent change of mode or rhythm. They maintained in the nomes the scale proper to each, which indeed is the reason of that name, these compositions being called “nomes” or “laws” because it was not permitted to go beyond the proper scale. As soon as the composer had done his duty by the Gods, he passed on to the poetry of Homer and other epic poets. This is proved by the Preludes of Terpander. As for the form of the lyre, that was established in the time of Cepion the pupil of Terpander; and it was called “Asian” because it was used in Lesbos which is adjacent to Asia. The last Lesbian lyrist to win the prize at the Spartan Carneia was Pericleitus. His death put an end to the continuous succession of Lesbian singers to the lyre. The Boeotian (tune), as it is called, and the Phrygian were invented by Terpander. Orthian and Trochaic Nomes: The two nomes so called from their rhythms by Terpander. They were high-pitched and of a vigorous character . . .
Further, Pindar tells us that Terpander was the inventor of scolia or drinking-songs. Something also should be said about rhythms. For there have been innovations in the form or kind of rhythms, and indeed of methods of metre and rhythm. Terpander first broke new ground by introducing into music a beautiful style of rhythm called after him the Terpandrean. Polymnastus who followed him employed a new rhythm as well as his, but preserved throughout the same beautiful style . . . The first establishment of music at Sparta was due to Terpander. Many circumstances could be cited to show that good music has been a matter for concern to the best-regulated states, and not least among these the quelling of a sedition at Sparta by Terpander. The Spartans, who bent was for bodily exercises and feats of arms, had no skill in music. Yet if ever they required the aid o the Muses on occasion of general sickness of body or mind or any like public affliction, their custom was to send for foreigners, at the bidding of the Delphic oracle, to act as healers and purifiers. For instance they summoned Terpander, Thales, Tyrtaeus, Nymphaeus of Cydonia, and Alcman. Next to the poet of Lesbos: Said proverbially of persons who come off second best. The singers to the lyre first called in by the Spartans were of Lesbos. When their city was torn by faction there was an oracle delivered that they should fetch the poet of Lesbos, and accordingly they sent for Terpander of Antissa, who was living in exile at Sparta because of a murder, and listening to his music at their public dinners, ceased their factious strife. Another account is this: The Spartans at a time of internecine struggles sent to Lesbos for the musician Terpander, who restored harmony to their minds and put an end to the strife of parties; and so whenever after that time the Spartans listened to a musician, the saying went “Next to the poet of Lesbos.” This proverb is mentioned by Cratinus in his Cheiron. Aristotle in his Constitution of Sparta declares that in the saying “Next to the poet of Lesbos” the reference is to Terpander, and it is said that the Spartans used to summon to take his place of honour17 first his descendants, then any Lesbian poet present, and the rest as they came, “after the poet of Lesbos,” that is after any poet that came from Lesbos. Trypon on the lyrist Terpes18 . . . : When in the Spartan Place of Meeting Terpes was singing a song to the thrumming of his sweet lyre, he perished never to return, not by a sword, nor yet an arrow, but by the casting of a fig between his lips. Alas! Death suffers from no lack of pretexts. Thus it is said that later during the Theban invasion of Laconia the Helot prisoners refused to sing at the bidding of their captors the songs of Terpander or Alcman or Spendon the Laconian, on the plea that their masters never allowed it. 14. the reading is doubtful. 15. Diodorus in Tzetzes Chil. 1. 16 calls him a Methymnaean. 16. the list is incomplete, and the High-pitched was probably identical with the Orthian; cf. also Suid. And Hesych. s. orthios nomos, Hdt. 1. 24. 18. apparently an abbreviation of Terpander, cf. Suid. s. gluku meli. Let us pour to the Daughters of Memory and their Lord the son of Leto. O [Sons] of Zeus and Leda, saviours most beautiful. 24. cf. Arr. Tact. fin. One of the men who had a name in Crete for wisdom and statesmanship Lycurgus prevailed on by favour and friendship to go to Sparta. This was Thales, who was ostensibly a composer of songs for the lyre but did the work of a lawgiver of the best sort. For his songs were exhortations to lawabidingness and concord made by means of melodies and rhythms themselves marked by order and tranquillity. [on the Cretans]: Similarly the rhythms they use in their songs are Cretan, the grave and severe rhythms invented by Thales, to whom moreover they ascribe the Paeans and other native songs as well as many of their customs. Thales who stayed the plague at Sparta . . . was a native of Gortyn according to Polymnastus of Colophon, who composed some epic lines on him for the Spartans. The first establishment of music at Sparta was due to Terpander. The second is best ascribed to Thaletas of Gortyn, Xenodamus . . ., Xenocritus . . ., Polymnastus . . ., and Sacadas. For we are told that the Feast of Naked Youths at Sparta27 . . . was due to these musicians . . . Thaletas, Xenodamus, and Xenocritus were composers of Paeans. Many circumstances could be citied to show that good music has been a matter of concern to the best-regulated states, and not least among these the quelling of a rising at Sparta by Terpander . . . And according to Pratinas, Thaletas the Cretan who is said to have been invited thither at the instance of the Delphic oracle to heal the Spartans by his music, rid their city of the plague which ravaged it. As for Thaletas of Crete, it is doubted whether he composed Paeans. Glaucus, who puts him later than Archilochus, declares that he imitated that poet with the difference that his songs were longer and he employed the Paeonic and Cretic rhythms. These had not been used by Archilochus, nor indeed by Orpheus or Terpander, but are said to have been derived by Thaletas, who thus showed himself a great poet, from the flute-music of Olympus. He used to amuse himself alone in his own house of a morning by singing certain ancient paeans of Thales to his own accompaniment on the lyre. See also Plut. Ag. 10, Princ. Phil. 4, Strab. 10. 482, Philod. Mus. xix. What was done in the lyric sphere by Terpander was done in that of the flute by Clonas, the first composer of flute-sung nomes and of processional songs: he used elegiac and epic verse. His successor Polymnastus of Colophon followed his example. The nomes of these flute-poets, my excellent Onesicrates, were sung to the flute, and Lament, the Comarchius or Rout-Leader’s, the Schoenion or Rope-Song, the Cepion or Garden-Song, the Dirge, and the Three-part. To these were added afterwards the Polymnastian Songs, as they are called. The successor of Terpander and Clonas is given as Archilochus. But some historians make out that Ardalus of Troezen composed music for flute and voice before the time of Clonas, and that the poet Polymnastus son of Meles of Colophon flourished before his day and composed the Polymnastian nome. The claim of Clonas to be the author of the Special nome and the Rope-Song is borne out by the compilers of the registers, and Polymnastus is mentioned by two of the lyric poets, Pindar and Alcman. The Thales who stayed the plague at Sparta . . . according to Polymnastus of Colophon, who composed some epic lines upon him for the Spartans, was a native of Gortyn. There were three modes employed by Polymnastus and Sacadas, the Dorian, the Phrygian, and the Lydian . . . The first establishment of music at Sparta was due to Terpander. The second is best ascribed to Thaletas of Gortyn, Xenodamus of Cythera, Xenocritus of Locri, Polymnastus of Colophon, and Sacadas of Argos. For we are told that the institution of the Feast of Naked Youths at Sparta, of the Provings in Arcadia, and of the Feast of Garments as it is called at Argos, was due to these musicians. Thaletas, Xenodamus, and Xenocritus were composers of Paeans, Polymnastus of the so-called Orthian or High-pitched Songs, and Sacadas of Elegies . . . Polymnastus, too, composed nomes to be sung to the flute. But whether, as the writers on the theory of music aver, he employed his musical powers upon the Orthian, in the absence of ancient testimony we cannot tell for certain. To sing the Polymnestian: This was a kind of musical piece. Polymnestus was a lyric poet of Colophon, of a very merry type. 29. the reading is doubtful, but cf. Mus. Script. Gr. Janus pp. 301, 302 (= Baccheius 41, 42) where these are said to be features peculiar to the Euharmonic scale. Periander was despot of Corinth. During his lifetime, according to the Corinthians – and indeed the Lesbians – a very marvellous thing took place, namely the rescue of Arion of Methymna from the sea at Taenarum by a dolphin. This Arion was the finest singer to the lyre then known, and is the first recorded composer of dithyrambs, which he named and trained Corinthian choirs to perform. It seems that he spent most of his life at the court of Peirander; but one day conceiving a desire to visit Italy and Sicily, he did so, and some times afterwards, having made large sums of money there, determined to return to Corinth. Accordingly he set sail from Tarentum, chartering a vessel manned by Corinthians, a people whom he thought, of all men, he could trust. But when they reached the open sea the crew conspired to secure his money by throwing him overboard . . . Putting on al his harper’s dress and grasping his lyre, he took his stand in the stern-sheets, and went through the Orthian or High-pitched Nome from beginning to end. Then he threw himself just as he was, dress and all, into the sea. The crew continued their voyage to Corinth; but meanwhile a dolphin, it seems, took Arion upon his back and carried him ashore at Taenarum . . . There is a small bronze votive-offering of Arion on the promontory of Taenarum, consisting of a man upon a dolphin’s back. According to Pindar the dithyramb was invented at Corinth, and we are told by Aristocles that the originator of this song was Arion, the first trainer of the cyclic or circular chorus. Fourth year of the 40th Olympiad (B.C. 617): Flourished Arion of Methymna, who was rescued by a dolphin off Taenarum. [cyclic-chorus-trainer]: Antipater and Euphronius . . . declare that the cyclic or circular choruses were first assembled by Lasus . . . The earlier authorities, however, namely Hellanicus and Dicaearchus, ascribe their origin to Arion of Methymna, the former in his List of Carnean Victors and the latter in his Treatise on the Musical Contests. Arion: Of Methymna, lyric poet, son of Cycelus, floured in the 38th Olympiad (B.C. 628-625). According to some authorities he was a pupil of Alcman. He composed songs, namely two Books of Preludes to Epic poems. He is also said to have been the inventor of the tragic style, and to have been the first to assemble a chorus, to sing a dithyramb, to give that name to the song of the chorus, and to introduce Satyrs speaking in metre. Vide Luc. D.M. 8, Strab. 13. 618, Paus. 3. 25. 7, Ael. N.A. 12. 45 quotes the hymn of thanks to Poseidon ascribed to Arion ; this hymn being of much later date will be found in vol. iii; for other refs. See Pauly-Wiss. Real-Encycl.